In a large bowl, whisk together flour and salt. Make a well in the center and pour in water, yeast and sugar. Let sit until foamy, about 5 minutes. Then, add olive oil and mix ingredients together until a dough forms. Pour dough onto counter and knead about 8-10 minutes. Place dough in a lightly greased bowl, cover and let rise until doubled, about 1 1/2 hours. Preheat oven to 500°F. Place risen dough on countertop and, using a rolling pin, roll out into a thin square. Using a pizza cutter, cut dough lengthwise, then crosswise, into squares about 3 by 3 inches. Mix together pizza sauce, oregano and basil and divide mixture among the squares. Make sure to leave about a 1/2 inch border sauce-free along all edges of the square, so your calzones won't be covered in exploded pizza sauce (I know this firsthand). Divide cheese among squares, too. If you think you've put enough cheese on the calzones but still have some leftover, don't worry. Better to underfill the calzones than overfill and risk them, once again, exploding. Fold over one corner of the calzone onto another corner to make a triangle shape. Pinch the edges closed,and roll them up and in as you go along, pinching closed all the way around until you think you've formed a tightly sealed calzone. Brush the tops of the calzones with a very light coating of olive oil, place on baking stone or parchment paper-lined baking sheet, and bake about 10 minutes, or until calzones are a golden brown. If pizza sauce/cheese comes out of the calzones during baking, don't worry. This is pretty much inevitable. They'll still taste delicious. Remove calzones from oven and serve immediately. What are your plans for the big game next weekend? If they’re anything like mine, they’ll include a couple beers, a lot of shouting at the television and a nice smattering of hors de oeuvres, including these Mini Pizza Calzones. I’m a really big fan of pizza, especially if it doesn’t come in the traditional pizza form. 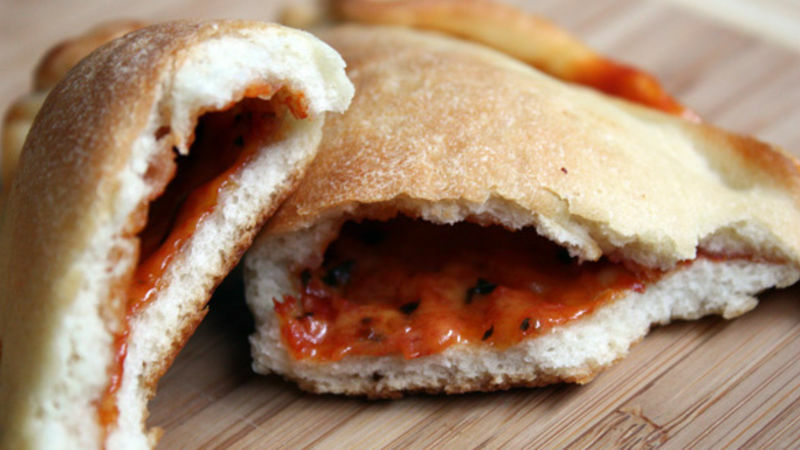 Give me homemade pizza rolls or these calzones over boring old pizza any day. Though it still tastes just as good, there’s something about eating my pizza in a creative form that makes it taste even better. Call me crazy, but it’s also much easier to dunk a calzone into a vat of tangy marinara or creamy garlic sauce than a messy piece of pizza. I must admit, I’d never made calzones prior to this post. I know, after all that talk of how I love nontraditional pizza foods! Well, now I have, and I must say it was a lot easier than I thought it would be. Something about folding pizza crust around a mixture of pizza sauce and cheesy had me a little freaked out – what if it spills? What if there’s not enough filling? What if I don’t fold them right and they come completely undone in the oven? And to be honest, all of these things happened while making these. But it wasn’t really a problem. Sure, there was a hint of a cheese/pizza sauce explosion on my baking sheets, and sure, I didn’t do the best job of pinching the seams of the calzones closed, thereby losing a bit of the filling. But, live and learn, right? That’s why I altered the recipe to (hopefully) not have you go through the same issues. But even if you do, the calzones will be just as delicious – perfectly pizza-y, cheesy and doughy, with a slightly crispy crust surrounding a tangy, gooey filling. Perfect for appetizers or as a pizza dinner substitute – or for the big game!